I have been re-working this text and image work I made late last year in a sound/image piece. Last Resort To Forgotten Funwas part of a series of works called ‘Stories From Time-locked Space’, which we included in our first publication, published earlier this year. An Hypothetical map for a Regional Identity Dilemma. In the United Kingdom many areas believe they are marginalised and overlooked in favour London and the South East. Although I’d argue the primary cause for such grievance isn’t geographically located, but located inside of us, from being subjected to the kind of society created through 40 years of fidelity to the ideology of market fundamentalism and market individualism – which personalises social problems, and affects people in London as much as the North (for example) – there are many reasons why people in the UK feel ignored and marginal to matters due to where they live. For example, “London will see £1,500 more in transport spending per person than the North over the coming years” a fact that is cause for bitterness for anyone who regularly has to use Northern Rail or Transpennine Express. Additionally, the idea that a sense of belonging to a geographical location has been totally illegitimatised by these globally interconnected times has been proven to be totally flawed. I think it’s an impossibility to expect the human animal to thrive with no sense of connection to an area they have lived in for a number of years. And it doesn’t have to be forged around hard oppositionalism to other regions. I’d argue regional identity can take on different forms, and doesn’t have to be borne from the alienation and humiliation many feel in impersonal nation states that can conversely result in a more ferocious fever of xenophobic nationalism. However that’s a topic for another time. Also, I’m not here to make such statements of what type of devolution should be sought, whether they would work, and all that, etc. I am simply employing my years making mind maps around the South and West Yorkshire areas, to hypothesise about ‘workable’ constitutional boundaries that could deal with the ongoing dilemma of devolution between the Sheffield City Region and the Wider Yorkshire Region.. Residents in the Barnsley and Doncaster districts are being asked to ‘have their say’ on a decision over whether to agree to be part of a stronger Sheffield City Region (which they are currently the most northerly areas of) or as part of a Wider Yorkshire Region. Barnsley and Doncaster councils have voted against on their initial agreement to be part of a mayor-run Sheffield City Region, in favour of a Wider Yorkshire Region, for reasons, they say, are due to the amount of changes in British Politics since the original agreement was made in 2015. After much consideration, I started playing around with an idea for a map that de-draws constitutional boundaries that I think could potentially work. Yorkshire is giant county in proportion with other England centres, with a massive sense of identity, which, in turn, has made it forget that some of the areas now in within its boundaries, weren’t always so. The reason ‘South Riding’ wouldn’t work, however, is due to one of the main obstacles to Sheffield being part of a Wider Yorkshire Region. Much of the south of Sheffield is situated, at least historically, in Derbyshire, especially as the housing developments continue to sprawl out towards the south and east. Additionally, much of the City Region that sees Sheffield as its nearest city is in Nottinghamshire. Although the nearest city to most of the Doncaster and Barnsley boroughs is Sheffield, they are also very close to the conurbation that has built up around Leeds. I think Sheffield would fair well being known as the centre of a ‘Hallamshire’. I roughly propose it would begin in the north, following the Don valley from Dunford Bridge, taking on Penistone (which has much more in common, culturally and geographically, with Sheffield, than it does being currently part of the Barnsley district). It would stretch to the eastern side of the Derwent valley in the Peak District, and follow the Rother valley from the south in Derbyshire and into Rotherham, and stretch out South East to include the former mining areas of north Nottinghamshire around Worksop. Even though this map is purely hypothetical I felt it still it could offend Sheffielder’s who feel just as strongly about their Yorkshire identity. Yet, I am actually trying to point that Sheffield’s ‘uniqueness’ (often evoked more by Southern expats who moved to the city, surprised how different the city is to the dated perceptions of it being an ‘unsightly’ place) puts it in a category of cities whose identities have outgrown their origins. Despite it being considerably smaller than Manchester and Liverpool, it is of similar ilk, in not belonging to one area, but of forging an area all for itself. Leeds’ identity, for example, seems to be far more at entwined with a Yorkshire identity, seeing itself as the main Yorkshire city. As we move ‘into’ Yorkshire from the hypothetical Hallamshire, I tried to make districts that I feel could possibly work both geographically and culturally. ‘Southwest Yorks’ would follow the Dearne Valley from its source on the hills just west of Denby Dale to its end as it joins the river Don. However, it would also include the land that lies south of the middle and lower Calder Valley. The reason for this district is that although much of this area is closer to the centres of Huddersfield, Dewsbury and Wakefield, once you actually hit their respective urban areas you are clearly in a wider urban area that is more than the sum of its parts and, although haphazardly, spreads right up to Bradford and Leeds. ‘Southwest Yorks’ roughly spans the areas of industrial Yorkshire that never became so built-up because they were largely mining communities. 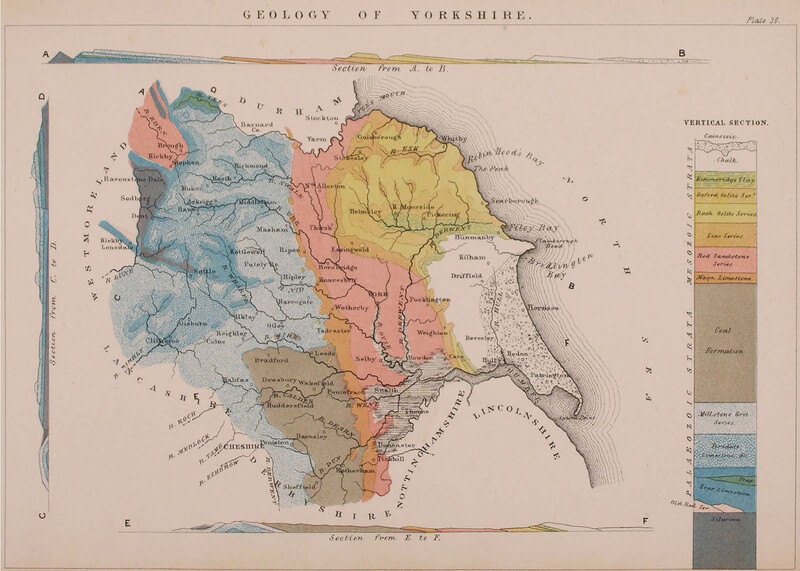 The same applies for the Doncaster area, but the reason I felt this was a separate area was due to its geography being more like the vale of York, which is noticeable in the change in the colour of the rock formations, which changes from the orangey brown sandstone found in ‘Southwest Yorks’ to a thin strip of ‘magnesium Limestone’ that runs north to south as the land flattens out almost completely. The ‘West Riding Metropolis’ was a hypothetical name that the writer Owen Hatherley came up with, to designate one of the most built up, heavily populated areas in England, which has never yet worked as a fully functional metropolis due to its incoherent and discontinuous urbanity; indeed, speaking of the current counties, as they stand, I feel it is accurate to call South Yorkshire a ‘discontinuous conurbation of villages’ and West Yorkshire a ‘discontinuous conurbation of towns’. The western perimeter of the former industrial side of Yorkshire also has a separate geography to the ‘West Riding Metropolis, a side that is a mirror of the land just over the pennine border. This area is post-industrial, yet is more rural, but unlike the mining areas, seems to visualise not only its own history but the very beginnings of the industrial revolution. I struggled for a potential name and called it ‘Mill Town Yorks’, but perhaps ‘Uppermill Yorks’ would be better. The area would likely start in the south at Holmfirth and follow the western edge of the West Riding Metropolis up to Keighley. These are very simple plays with the area of I know of Yorkshire best, and I don’t expect it to be taken too seriously. However, it would be nice to think it could help think differently about a wider area which certainly needs infrastructural rethought.